The European Hedgehog (Scientific name – Erinaceus europaeus), Common hedgehog, is a hedgehog species found in northern and western Europe. But it is also seen in Bangladesh. It is about 20 to 30 cm in length and adult weight typically ranges from 600g (after hibernation) to 1,200 g (prior to hibernation) and occasionally may reach as much as 1,600 g. Males tend to be slightly larger than females. The European Hedgehog lives in woodland, farmland and suburban areas. 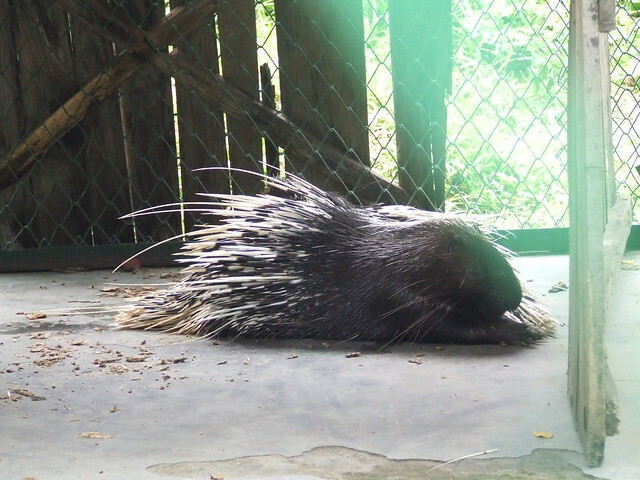 It is nocturnal, and if alarmed will roll into a ball to protecting itself against potential predators with its spines. Unlike the smaller, warmer climate species, the European Hedgehog may hibernate in the winter. It is omnivorous, feeding on a wide range of invertebrates, but prefers slugs, earthworms, beetles and other insects. The preferred arthropods are the millipedes Glomeris marginata and Tachypodoiulus niger as well as the ground beetle Carabus nemoralis. It is also known to eat frogs, small rodents, young birds and birds’ eggs. This photo was taken on July 25, 2010 using a Fujifilm FinePix S5600 from Jamuna Eco Resort. This entry was posted on June 25, 2012 by Tareq Salahuddin. It was filed under Wildlife in Bangladesh .